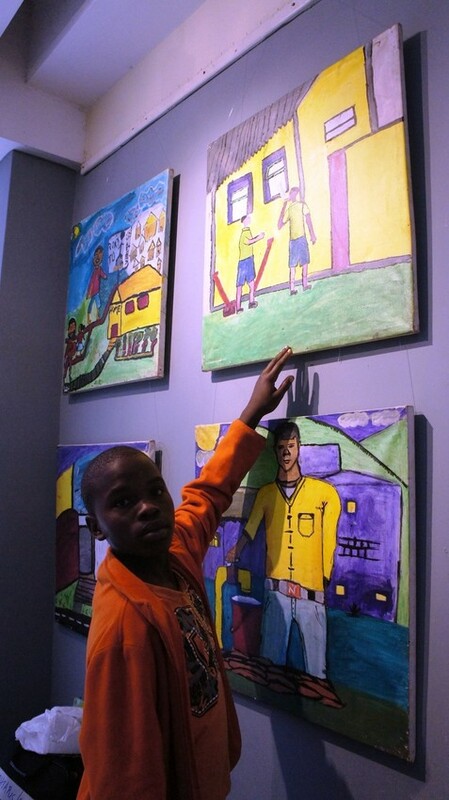 Children enrolled in ChildFund’s programmes near Nairobi participated in an art exhibition featuring photos and paintings they made, often depicting their surroundings. 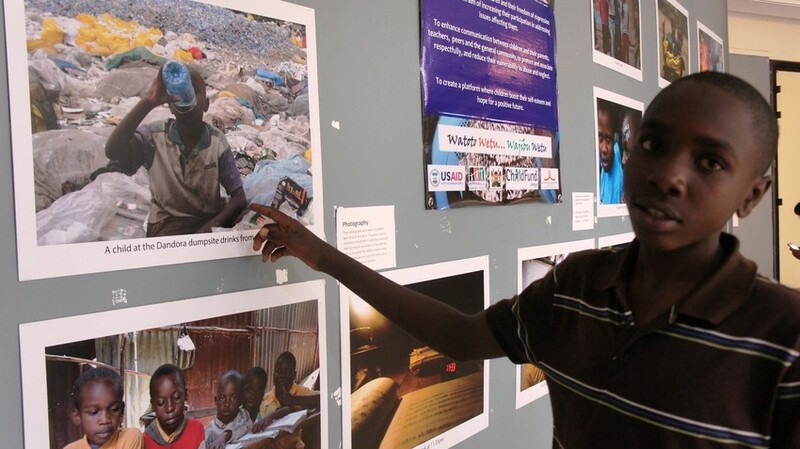 Weslyne, who is 13, shows a photo he took of the Dandora dump near his home. Covering an area of 30 acres, the dump accepts about 850 tons of solid waste generated daily by the 3.5 million inhabitants of the city of Nairobi, Kenya. The dump, which is the largest in Africa, was once a quarry that the City Council of Nairobi sought to use temporarily. But it still exists, 40 years later, despite having been declared full. Residents have to live with the stench, trash and dirt. Waste pickers pounce on trash once it is offloaded by incoming trucks. Birds, pigs and people scavenge heaps of rubbish for food, scrap metal, polythene bottles and bags, which are often sold. Weslyne explains that the dump also attracts children and youth who would rather scavenge than go to school. His photo shows a boy drinking water from a bottle that was probably scavenged from the trash. 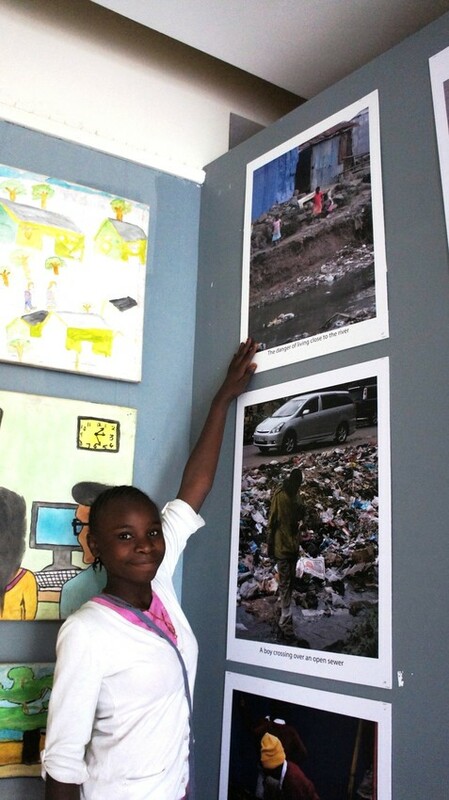 Regina, 14, comes from Mukuru’s fuata nyayo (the Swahili term for outskirts). Mukuru is a slum on the eastern side of Nairobi. It is one of the largest slums in the city, with a population of around 700,000. Mukuru is sub-divided into eight villages and is located in the middle of the main industrial area of the city, bordering the Nairobi River. It is characterized by congestion, narrow alleys, poor drainage, lack of sanitary facilities and open sewers. Regina explains that her photo shows children walking alone and dangerously close to the edge of the river. You can learn more about ChildFund’s work in Kenya here. Please consider sponsoring a child today!